The Department of Aerospace Engineering's Student Design Team (SDT) won first place in the graduate division of the American Helicopter Society's (AHS) 30th Annual Student Design Competition with their HeliX design. The AHS Student Design Competition challenges students to design a vertical lift aircraft that meets specified requirements and provides a practical exercise for engineering students while promoting student interest in vertical flight technology. This year's competition required students to design a search and rescue helicopter for rescuing victims of a natural disaster. The helicopter had to feature a large payload capacity that could accommodate both human or supply cargo and operate safely across a wide variety of terrain to support the extraction of people trapped in dangerous areas. 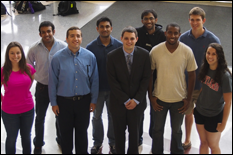 The Maryland SDT was led by aerospace engineering graduate student Elizabeth Weiner, who is also a team member on the Gamera II project, and included fellow students Teju Jarugumilli, James Lankford, Jaime Reel, Bharath Govindarajan, Nishan Jain, Erik Levin, Benjamin Jimenez and Zak Kaler and faculty advisors Dr. V. T. Nagaraj, Dr. Inderjit Chopra, and Dr. J. Gordon Leishman. The team's HeliX design featured key components such as a variable diameter tiltrotor and outboard wing extensions (OWEs). 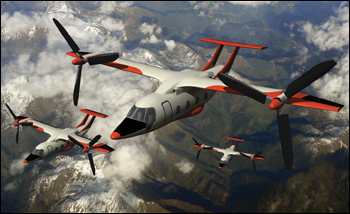 A tiltrotor provides increased speed, range, and altitude capabilities, while the ability to change the diameter of the rotor enables the craft to function efficiently in both helicopter and airplane modes. The HeliX's unique, telescoping blade system allowed for varying the rotor diameter when moving between hover and forward flight modes while maintaining a high level of operational safety, reliability and structural efficiency. The HeliX's OWEs increased the wing aspect ratio and enables the HeliX to achieve airspeeds in excess of 240 kts. "The dedication and innovation that this team showed in order to create this design was remarkable." Department of Aerospace Engineering Chair and Minta Martin Professor of Aerospace Engineering, Dr. Norman Wereley said, "Once again, the AHS Student Design Team was exceptionally innovative and worked hard to achieve this outstanding result!" The project, which began last year, required the students to put in many hours of work and even some sleepless nights to complete their proposal and design. "The dedication and innovation that this team showed in order to create this design was remarkable," said Weiner. "As team leader this year I am proud to have worked with a team that extended the University of Maryland's legacy for greatness." AHS student design winners receive a stipend and have the opportunity to send two representatives to present at the AHS International’s 70th Annual Forum and Technology Display held May 20-22, 2014 in Montréal, Québec. To read more about the HeliX design and the competition, visit the AHS Student Design Competition website.